Stocks gained traction Tuesday afternoon, pushing the Dow to a new record closing high. 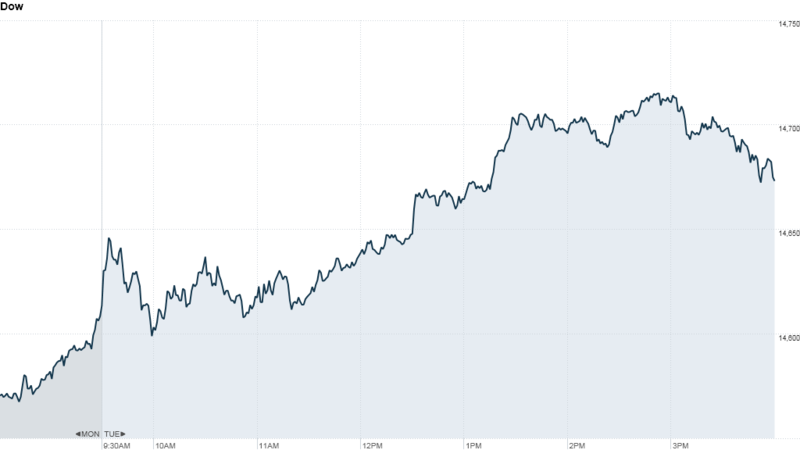 The Dow Jones Industrial Average added 0.4% to end at a new high of 14,673. Earlier the index hit an intraday record high of 14,716. Microsoft (MSFT) and Intel (INTC) were among the biggest gainers on the blue chip index. The S&P 500 and the Nasdaq edged up between 0.4% and 0.5%. Solar stocks got a big boost after First Solar issued much-better-than expected guidance. Shares of First Solar (FSLR) soared more than 45%. Solar energy ETFs, including Guggenheim Solar ETF (TAN) and Market Vectors ETF (KWT) spiked, as did solar power company SunPower (SPWR). 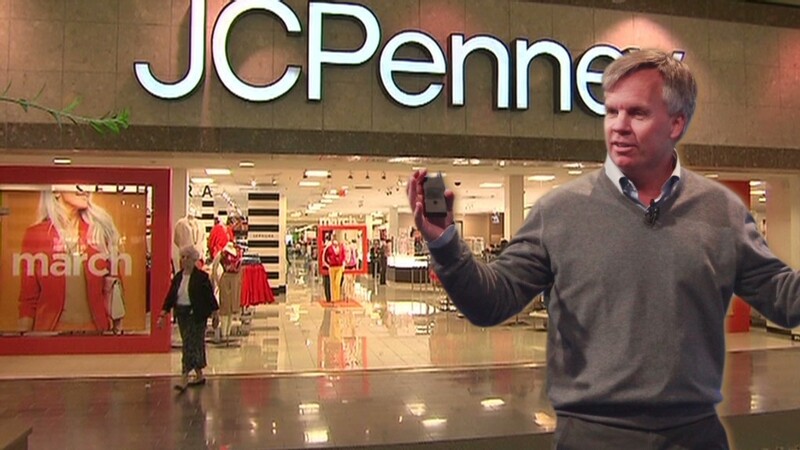 In other corporate news, J.C. Penney (JCP) shares tumbled after the retailer announced that it was replacing CEO Ron Johnson with his predecessor, Mike Ullman. More than 89 million shares traded by the close -- more than eight times the average trading volume for an entire day. Can JC Penney be saved from itself? Meanwhile, Herbalife (HLF) announced that KPMG had resigned as its auditor because of an alleged insider trading scheme in Herbalife stock that involved one of KPMG's former partners. After being halted for most of the morning, Herbalife's shares closed down 4%. Analysts at DA Davidson downgraded the stock Tuesday afternoon. KPMG also resigned as the auditor of Skechers (SKX) as part of the same alleged insider trading situation. After being halted in the morning, Skechers' shares jumped 2% once they resumed trading. Shares of real estate brokerage firm Realogy (RLGY) dropped nearly 9% in after hours trading, after the parent company of Century 21 and Coldwell Banker announced preliminary first quarter results that missed estimates. Investors are waiting for more corporate results after Alcoa (AA) unofficially kicked off earnings season late Monday. The aluminum producer, which beat analysts' earnings expectations, is often considered a proxy for corporate results. Over the past 10 years, when Alcoa beat earnings estimates, the S&P 500 rose an average 4.4% during the following three months, according to FactSet, which forecast overall earnings growth to contract 0.6%. But Dan Greenhaus, chief global strategist with BTIG, noted that there have been four times as many negative pre-announcements than positive ones. Mega-banks JPMorgan Chase (JPMPRI) and Wells Fargo (WFC) are set to release quarterly results later this week. After this year's strong run, most analysts expect investors to periodically tap on the brakes. All three major indexes have rallied 8% to 12% since January, and the Dow and S&P 500 have both set new record highs this month. With little U.S. economic news on the calendar, investors also grappled with mixed reports on the health of the global economy. Reports showed that inflation in China was falling, yet stalled growth in the eurozone continues to worry investors. Exports out of Germany fell faster than expected in February. European markets closed mixed, helped by news of falling inflation in China, which also boosted the Shanghai Composite and the Hang Seng. Japan's Nikkei was flat. The dollar fell against the euro, the British pound and the Japanese yen. Oil and gold prices rose nearly 1%. The yield on the 10-year Treasury hovered around 1.75%.